Memberships need to be canceled online. 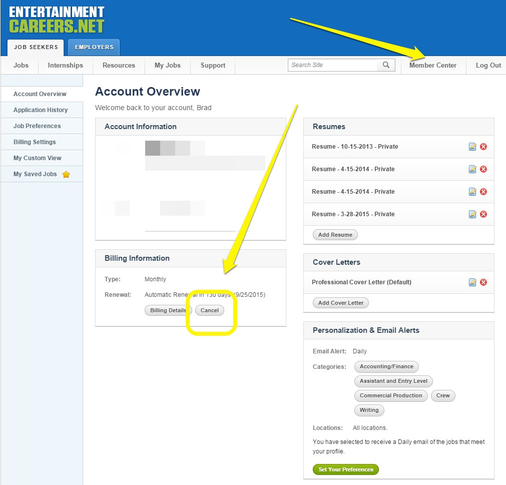 In the "Member Center " go to the "Billing Information" area. You will have the option to cancel your membership. Here is a shortcut. Upon cancellation, you will receive an email confirmation. Please keep this for your records. If you are canceling because you found a job, please also submit a success story. If you let us know your start date, you may get a fun treat delivered to work. If you are canceling for any other reason, please let us know as well. Our goal is to provide a great set of tools, and if you have any suggestions for improving the service, we welcome your feedback. While we love hearing our success stories, we also need to know where we still have work to do so we like feedback of all kinds.